Wood chip/bark mulches and composts can be a source for several interesting fungi including artillery fungus, slime molds, bird’s nest fungi, stinkhorns and mushrooms. These fungi often raise questions from home gardeners, particularly after rainy weather. Wood, bark and composts, as organic matter, naturally decompose over time. Bacteria and fungi are involved in this decomposition process deriving their energy for growth from these carbon-based compounds. These fungi are natural components of the mulch environment, are not harmful to landscape plants, and no known health hazards are associated with them unless they are eaten. They are usually found from April through October, following rainy weather. Shotgun or artillery fungus (Sphaerobolus), although not considered to be pathogenic to living plants, can be a problem in other ways. While it decays or breaks down the mulch, it also produces fruiting structures that resemble tiny cream colored or orange-brown cups that hold a spore mass resembling a tiny black egg. As the cup-like structure absorbs water, pressure is built up and eventually the cell inverts and bursts with such force that the spore masses are propelled as high as 6 feet and distances of 12 feet or more, toward light or light surfaces. These spores stick to surfaces such as cars, siding or leaves and resemble small tar spots. Once it sticks in place, the spore mass is very difficult to remove without damaging the surface to which it is attached. If removed, it leaves a stain. A few of these spots are barely noticeable, but as they accumulate, they may become very unsightly on houses or cars. Also, sanding or scraping the spores and letting them fall back onto the mulch will re-inoculate the mulch. Moist, rotting mulch appears to be an ideal situation for artillery fungus, especially foundation mulches located on the cool, north sides of houses. To minimize artillery fungus, avoid highly susceptible mulches containing wood and shredded blends of bark and mostly wood from large commercial piles. A four-year study, “Artillery Fungus Sporulation on 27 Different Mulches” conducted by The Pennsylvania State University showed wood pieces and shredded blends of bark and wood that absorbed moisture supported significantly greater levels of artillery fungus sporulation than large, hard, dry pieces of pure bark, such as pine bark nuggets. Almost all wood/bark mulches will eventually support artillery fungus over time (3-4 yrs), and should be replaced or covered with a fresh layer of mulch. To date there are no known ways to manage the artillery fungus other than to avoid using wood chips/ bark mulches next to buildings. Where wood mulch already exists, frequent disturbance by raking the mulch surface may help keep it dry and less inviting. Slime molds, although not really a fungus are normally a temporary nuisance confined to small areas. In addition to mulches and composts, slime molds are often found on old well-rotted logs, where they can find the moisture and bacteria required for survival. 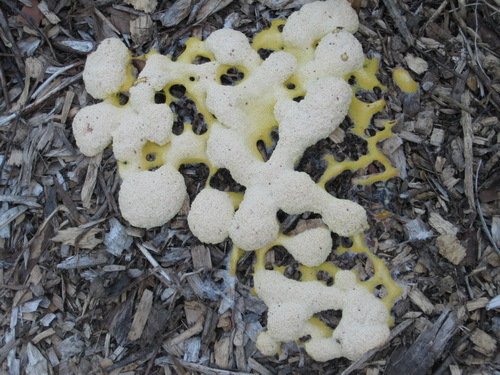 Slime molds or "dog vomit" fungus are brightly colored (yellow, orange, etc.) slimy masses that are several inches to more than a foot across that feed on bacteria growing in the mulch. These molds dry out and turn brown, eventually appearing as a white, powdery mass. If their appearance is offensive, discard the slime mold in a compost pile, household garbage, or a spot in the yard away from existing mulch. Bird's nest fungi resemble tiny grey to brown bird's nests up to 1/4 inch in diameter with eggs. 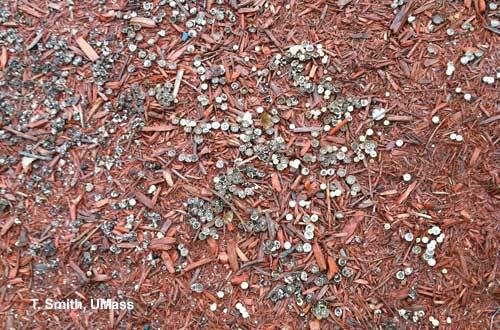 These fungi may grow in large areas of mulch, but they are not a problem. The "eggs" or structures of the fungus splash out of the nest when hit by a raindrop. These structures occasionally stick to surfaces, but they are easily removed and do not leave a stain. These naturally occurring fungi decompose organic matter and do not need to be removed. Other fungi found on mulches include stinkhorns and mushrooms. The cap of the stink horn gives off a very unpleasant odor. Stinkhorns produce a sticky spore mass on their tip which has an odor of dung, or other things that attract flies. The flies land on the stinkhorn and in doing so collect the spore mass on their legs and carry it to other areas. Mushrooms are fleshy, spore-bearing fruiting bodies of fungi typically produced above ground and reproduce by airborne spores. Mushrooms come in various colors, shapes, and sizes ranging from less than an inch to several inches tall. Some are soft and fleshy and disappear soon after they emerge; others may remain in mulch for a few days, weeks, or an entire growing season. Mushrooms may be poisonous if eaten and should be removed if small children have access to the mulched area. Note that some people use the term “toadstool” to describe poisonous mushrooms. There is no control for nuisance fungi other than to frequently disturb the mulch by raking the surface to dry out the area so it will be less inviting.